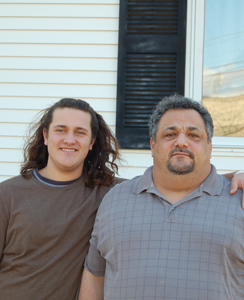 Mike (pictured with his son) lives in a small white Cape with a gravel driveway. There is nothing fancy inside—no designer colors, no exotic furniture and no sophisticated artwork. There is one thing that makes the house beautiful in Mike’s eyes, though: it has sheltered three generations of his family. That’s why when Mike received a foreclosure notice from his bank in summer 2010, he was desperate. He turned to legal aid for help, hoping he would not have to leave the place he, his parents and his children had called home. In 1946, Mike’s mother moved the house from its original location in Onset a few miles up the Cranberry Highway to Wareham. There, it joined several other small houses to form a family compound, a half-mile strip along a two-lane road set among cranberry bogs and stands of pine and oak trees. It is small and homely compared to the oceanfront mansions of the Kennedy compound 30 miles away, but just as idyllic a place to spend a childhood. If Mike felt like exploring, the 10 acres of forest and bog just beyond his back door beckoned. Mike grew up, moved away and started a family of his own, but memories of his childhood stayed with him. In 2000, after coping with the deaths of his parents and his own divorce, Mike decided to move his family back to his childhood home and looked forward to many happy years to come. Life at the compound may have been just as Mike had remembered it, but the world outside was not as pleasant. Like many jobs during the Great Recession, Mike’s position as an accountant was eliminated after his company was sold. With no income, he couldn’t make the high monthly payments on his mortgage. He needed to refinance to avoid insolvency. Mike’s first application to refinance was approved, but he didn’t receive the paperwork until the day it was due. Rather than extending the deadline, the bank told him he would have to reapply. Mike did so, but this time the bank refused to refinance, explaining that they now wouldn’t consider a modification unless he was at least three months behind on his payments. Mike had never been late for a mortgage payment, but he knew he didn’t have the money to continue making his high monthly payments. After three months, he called the bank again, hoping for a reprieve. It was not to be. His third request for a modification was denied and the bank initiated foreclosure proceedings. One Tuesday afternoon as Mike pulled into his driveway, an auctioneer was standing in the front yard. His house was up for auction at a starting price of $331,000, nearly twice what he owed. A bid was out of the question. The bank bought Mike’s house, and soon he received an eviction notice. So he didn’t give up. He found a loan he could afford from an organization that repurchases foreclosed homes. He applied and was approved, but he needed legal help to defend against the eviction proceedings and negotiate the sale. The organization referred him to South Coastal Counties Legal Services (SCCLS). An attorney there was able to stop the eviction, but finding a way for Mike to repurchase his house wasn’t easy. After many months of court battles, Mike’s SCCLS attorney succeeded in negotiating the sale, and in November 2012, he was able to own his childhood home for the second time. And as for the house itself? Now that Mike has an affordable mortgage, he decided to invest in some renovations. No exotic artwork or designer furniture, but enough to breathe new life into the walls that have sheltered three generations of his family.